ABOUT ~ SOUND IS FUN! 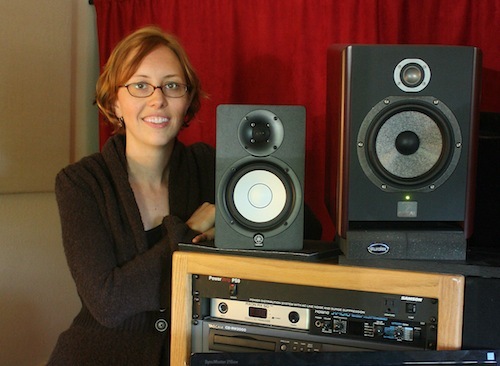 My name is April and my goal is to provide information and ideas how to interact with sound and audio/music technology that is fun, easy, and educational. Because I have a toddler, there’s going to be a lot relevant to that age (I’m still learning, too!) For older kids, we’ll look at how to take that interest in sound to the next level. It’s common for a teen today to either play an instrument, write music, make movies or podcasts, or all of the above. Sound is a key part of all of those! I have been working in sound for tv and movies for over 15 years. I have two degrees (Bachelor’s and Master’s) in Sound and Music Technology. When I had my son in 2016, it opened up a whole new area of sound for me. I had no idea what babies could hear in the womb or how much background noise affects a toddler learning words. I want to share what I’m learning (from research to activities) and I hope other parents, caretakers and teachers will find it interesting, too.